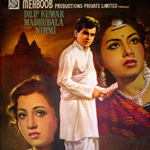 "Amar" is a 1954 hindi film which has Dilip Kumar, Nimmi, Madhubala, Jayant, Ulhas, Murad, Mukri and Husn Banu in lead roles. We have 3 songs lyrics and 3 video songs of Amar. Naushad has composed its music. Lata Mangeshkar and Mohammad Rafi have sung these songs while Shakeel Badayuni has penned its lyrics.